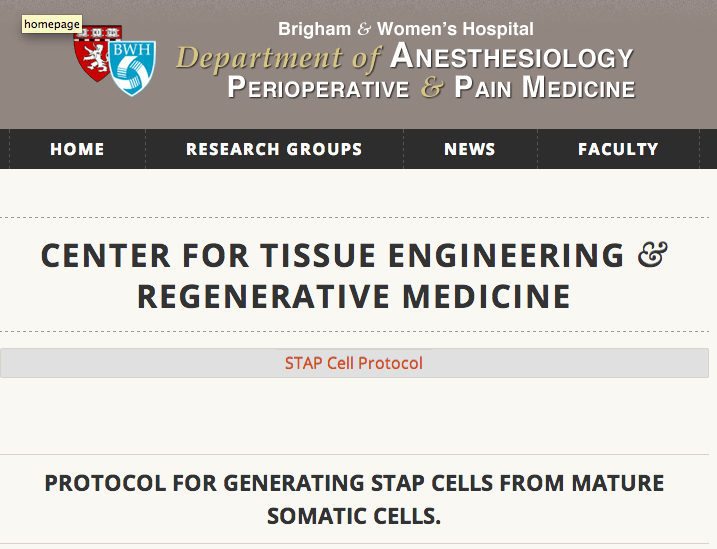 The Vacanti Lab at Brigham and Women’s Hospital/Harvard Medical School has now posted online their own version of the STAP cell production protocol. The thing that first struck me most strongly about this published protocol is that it is not the same protocol reported in the Nature papers and it also is not the same as the recently posted RIKEN STAP protocol. Given that the two STAP papers were just published 7 weeks in Nature, how can there already be so many different protocols coming from one collaborative team? I don’t know, but it seems puzzling to me. This new Vacanti Lab protocol involves combining in sequential steps both of two key stressing steps for cells: trituration and acid treatment. The main difference from previous protocols seems to be the implication that both of these stressors in combination are recommended. Further the trituration is divided into 3 steps: cells going through a standard Pasteur Pipette, cells then going through a pipette with a 100-150 micron lumen and then finally through a pipette with a smaller lumen of 50-70 microns. Since the average cell diameter is about 10 microns, I’m not quite sure what happens to cells as they go through these pipette lumens, and how it would be connected to reprogramming. Presumably many cells are mechanically destroyed during this process by literally crashing into the edge of the lumen or squeezing through in clusters, others are mechanically damaged, and perhaps a minority survive just having been subject to pressure and sheer stress. It seems to me like a very imprecise, crude process of cellular battery. The recommended fire polishing process including breaking the end seems subject to great variation, although using such customized pipettes for other applications is not unusual in biomedical science experiments. After trituration, then comes the acid treatment that is literally referred to by the protocol authors as an “acid bath”, and placement in “sphere media”, which is changed regularly. There the protocol ends abruptly. Overall takes on the new protocol? I would say that to my eye this protocol seems far less detailed than the online RIKEN one. For example at step A7, acid treatment, there are no details given as to the actual exact cell # to be used and the volume of low pH buffer to be used is not stated. It just says 2 million cells/ml in a general sense. Isn’t the total volume here important particularly since addition of cells raises the pH? The greater the total volume the lower the impact of the cells on the overall pH, right? What is also notable about this protocol more generally is the large number of other seemingly important things that are not mentioned in it. There is no mention of efficiency, validation, expected results, the kind of starting cells, the species of cells, the % cell death expected at any given step and how this is assessed, sorting procedures before or afterwards, and a whole lot more. Puzzlingly, the protocol in addition has no listed authors and is not signed so I am just inferring that this is coming from the Vacanti Lab. Maybe they can post a new version that includes more detail later. Will this new protocol help other labs make STAP cells? One can hope, but I remain fairly skeptical that these procedures would specifically create totipotent stem cells. given the sorrow financial shape of many of these “investors” of STAP, i am inclined to believe there will be no retraction. this is further evidence that the investors are planning to hang on until they’re forced to. with the retractions, the dog and pony show ends. there would be no more discussion of the validity of the PUBLISHED PROTOCOL (this is KEY people. THIS IS THE POINT OF PUBLICATION). let’s hope the people put more pressure. right now this isn’t going anywhere. they’re hoping we get tired. After that, yeah…why no commentary on expected results? Shouldn’t that have been in…a science (lower case) publication? Just the simple basics of do these reactions, get these results? Why should anyone even replicate it with no correlated results? And then why isn’t this sort of stuff in the methods section of the paper? Nature magazine should hang its head in shame. Well…. this is what you should expect when their method journal – Nature Methods put the methods section in the supplementary materials. I freely admit that I have never in my live (at least not knowingly) worked with stem cells. At least to an outsider this method sounds like pure voodoo. Yes, here is one: disgust. Hello, yes I have been following this saga and still waiting for the dust to settle, and re-settle and so on. The above seems to be damage limitation! Also now I am unsure really what advantage these potential STAP (note potential) cells have over hiPSCs, in terms of production. As now we can potentially get good quality colonies within 15-20days, the expansion process and validation process is the same ! I think the field has been swept up in a media frenzy…as this is supposedly the best thing since sliced bread! Sadly now gone stale! Expected yield: some credibility retained. I have no idea what centrifuge they use: “rpm” won’t help me at all. Is it just coincidence that I continue to see amateurism from these groups? I would have been happier if they showed their own STAP cell lines. After evidence of data manipulation and plagiarism in their papers, people are no longer interested in possibility of reproduction; rather, they are interested in “existence”. If I understand the protocol correctly here, than you take 2 million cells per ml of low pH buffer. So the greater the total volume, the higher the total number of cells. So, I think there should not be a difference in the impact on the overall pH. However, I would definitely be interested in some cell counts and respective viabilities at/before step A7, e.g. in A1 (starting cell count) and A6 (live fraction after trituration). No doubt there are many unanswered questions arising from the publication of this methodology to satisfy all relevant parties who review it. I believe the RIKEN methodology was only applicable to mice, whereas this methodology, whatever its shortcoming (I am not a researcher) appears to apply to any adult stem cell? Very strange protocol – amateurish at all levels. Step A7 is particularly head-scratching. They want us to make up the HBSS at slightly lower than pH 5.6 to accommodate changes from the addition of cells. So, in the A7 title it says to use pH 5.4. But, the instructions don’t *say* to make the HBSS at 5.4 so that the final is 5.6. They say to make the HBSS *stock* at 5.6, even going so far as to give the tenths-decimal place in “11.6µl of 12N HCl”. And last but not least “The instructions below will show…” when the instructions are *above* this sentence! I also love how they say tissue should be digested in “50-500µl of collagenase.” Which collagenase, they are not all equivalent! What is the concentration? Very frustrating. This is a Harvard lab? Ah, they fixed step A7 in the pdf. But there’s no mention on the webpage that they fixed it. People might not follow the pdf and just print out the html! It seems to me that it was made by someone who doesn’t know biochemistry. HBSS buffer was designed to work as a buffer at pH 7-8. It doesn’t work as a buffer at pH 5-6, especially pH is so important for this protocol. They should have used the buffer for low PH, such as MES. pH dependence of mitomycin C-induced cross-linking activity in EMT6 tumor cells (Cancer Research, 1985) http://www.ncbi.nlm.nih.gov/pubmed/3926302 ← Maybe this is one of their references? Primary aim:knock down the authors. Scientists can find this answer easily. Please read manuals or articles. No need for explanation. You can read manual for final concentration. I am sorry, but please use the thing in your skull. (XXXX edited) I think this absurdity is related with patent etc. Please wake up. First, just to be clear, I have no connection to iPS. I have no personal or career investment in the outcome of this investigation. Second, anyone who has worked extensively with collagenase would know that it isn’t quite so simple as looking it up in a manual. For general use, yes, if you are just going to do short-term culture, for example, that’s fine. But a lot of delicate work, including flow sorting for particular delicate markers will take trial and error. In the context of this situation, the Vacanti lab has made it clear that STAP is a very precise process. If they have truly successfully tested many organs, they should include a full list of collagenase types and concentrations for each organ. One of the major criticisms has been whether the various harsh treatments might select for preexisting stem cells – collagenase can be a harsh treatment (depending on context) if not done to specification. The inclusion of a detailed protocol in this light is not only to let other people repeat it, but also to let people judge whether it was done properly in the first place. In the age of youtube etc, would it be wrong to film and show the method in operation as an end to end process to supplement a methods statement? I realise this is an additional skill, and adds time, and will inevitably invite comments about editing etc., but as in cooking a recipe can sometimes lack something of the nuances of preparation. I realise this might be a naïve suggestion, perhaps in the context of patent protection etc. but grateful for some views. Why I am a believer of STAP? Not because I believe the Nature papers are correct, but because we have little information on cellular response against burden of stresses, such as ‘cell-polishing’ and exposure to mild acid. Now we have three protocols for STAP; Nature reports, RIKEN tips, and Vacanti lab protocol. This indicates that STAT protocol is incomplete or as yet unstandardized. Thus, researchers should find better protocol for STAP by themselves comparing with the open ones. They should seek their own optimal conditions of pH treatment and of ‘trituration’ maneuver. I think that STAP cells, if they exist, will be barely alive and unable to proliferate. Since those cells will be ready to die, experiments probably should not stay on STAP but boldly go to STAP-stem. And, we may need fundamental studies on cellular responses upon ‘stress’ burden; what genes and how the genes are activated or inactivated, and so forth. At any rate, I think that we are in the early phase of STAP study, although the goal might be an illusion. I am a reader of Lee’s STAP Blog. And, he found elevation in Oct4, Sox2, Nanog genes expression. But, he decide to stop his experiments about STAP. Why? Because, he and Dr. Knoepfler believe that STAP cells can’t exist, they think that this is a case of false positive. This is so strange. They can decide according to an assumption or belief. Perhaps, they will go to Vatican of Science (Center of Believers in Science ). Finally, Lee wrote as “In my case a 10 folds increase in Oct4 and Nanog expression is definitely not sufficient and we need to see at least 100 folds as in my previous post (see above Figure3 for iPSCs). And for Sox2 it is only at 2 fold increase – which is even worst.”. STAP cells and iPS cells are not same. iPS cells are programmed for expression of the genes and we don’t know anything about the minimum need of expression for dedifferentiation. We can see only a small part of the iceberg, we have limited data. Mr. Knoepfler, you have adequate funds for STAP experiments, but you only talk, please do something like experiments. A STAP experiment’s budget is a grain of sand for Knoepfler Lab. Obokata and her experimental design maybe a hoax, but STAP maybe not a waste, we must give a chance and study about STAP cells until the end. Fine, why don’t *you* pay for it? Reagents and equipment are expensive in solid biomedical work, as is lab tech and grad student Time. This is expensive work. Blind alleys are a waste of money. And it takes time and effort and expertise to build foundations from which profitable applications may arise, in all technological endeavors. Gotta lay the foundation prior to filing the patent……. Total Cost: ~3000 US Dollar for Europe. I think you have incubator, etc. Don’t worry, RIKEN will manage to reproduce the STAP cell stuff. Just wait and see….